Our story approaches its climax: Our Hero prepares for the cataclysmic action on which all depends. 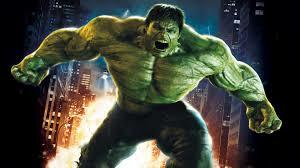 She tenses her muscles, tightens her fists, screws up her face into a tense grimace. Or does she? There are actually two ways to imagine how one achieves some brilliant feat. We have conflicting ideas about what makes action most effective. The most common view is that passion brings a sort of high-tension focus that intensifies action. (I’m using “passion” here to mean any violent emotion or supreme effort, not specifically romantic passion.) The more you feel, the more vigorously you act. This connection obviously correlates with our common experience. 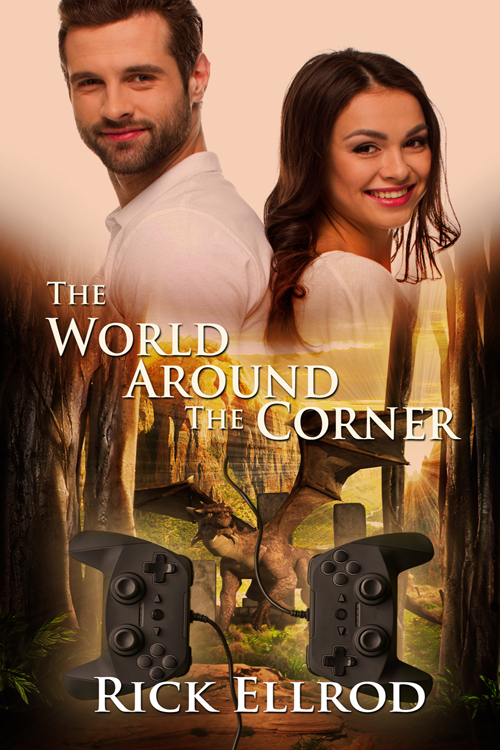 F&SF, as always, takes the idea to new levels. But we also see passion as the path to other kinds of achievement. Great stress, suffering, or effort leads to a breakthrough in ability. 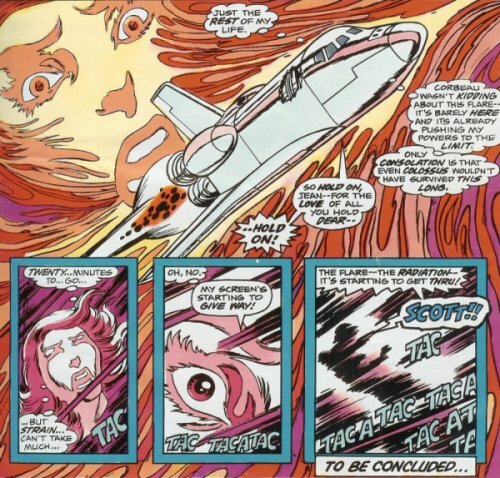 Jean Grey of the X-Men becomes the cosmic-powered Phoenix when her power and endurance are tested to the limit piloting a space shuttle through a solar flare. It was agony to move. Everything tried to beat me aside. The waters were cold, then boiling. It seemed that they constantly pushed against me. I struggled, putting one foot before the other. In Julian May’s Saga of Pliocene Exile, the tormented Felice Landry achieves new levels of power under extreme stress (The Golden Torc, part III, ch. 3). On a more positive note, the coda of E.E. Smith’s Lensman series shows Clarissa MacDougall, intensely suffering the loss of her beloved, finding the power necessary to retrieve him from unimaginable reaches (that chapter is a trope namer for TV Tropes’ “The Power of Love”). 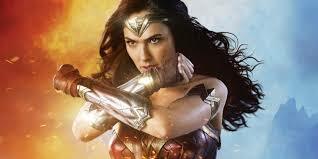 Just last night, I saw the movie version of Wonder Woman (excellent, by the way) use the sa me trope: a climactic accession of power under immense emotional strain. Some of the modern roots of the passionate effort concept can be found in the Romantic movement. But there’s a more paradoxical view that we can achieve more when we stop concentrating and enter a state of calmness or centeredness. It’s through “the Void” that Rand can be most effective with the sword—and, later, with other things. 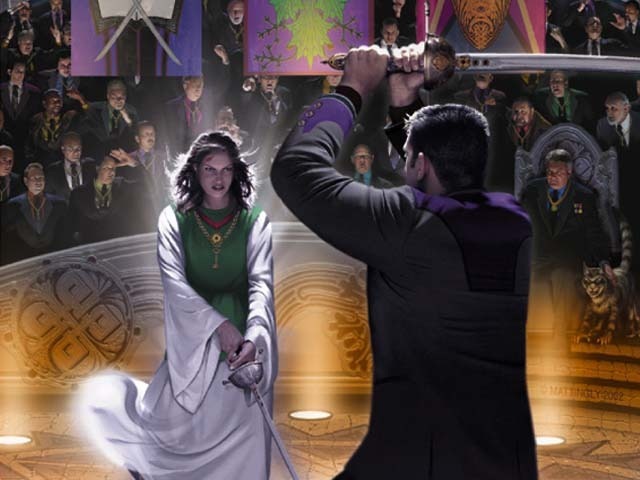 David Weber’s military SF heroine Honor Harrington, after surviving a shuttle explosion and emotional trauma, faced with a ritual duel to the death, dramatically decapitates her opponent with a single stroke. But she doesn’t do it in a burst of rage, well-justified as that would be. We might also compare Frozen, from a previous post. Elsa gains full control over her powers not when she lashes out passionately, nor when she painfully restrains herself, but when her power flows freely and gladly. It’s hard to specify exactly what this dis-passionate state is. It’s not pure rationality, à la Mr. Spock. We might consider it a sort of pure will; but it’s not a blind will creating its own goal à la Nietzsche. What you’re seeking still matters greatly; this Void state is how you approach it. Nor is it lack of restraint, as we saw with Frozen. Rather, the mindful actor seems to have perfect direction, perfect control, by means of this very Void state. The arrow goes straight to the target—but it strikes with unparalleled force. We don’t see as many examples of such centered intensity in the movies. Film tends to prefer the display of passion: it’s showier. A character whose action arises from an inner balance is likely to look entirely inert, from the outside—until she moves. What these two approaches have in common, maybe, is wholeheartedness. This seems to be the point of Yoda’s famous advice: “Do, or do not; there is no try.” Mr. Miyagi says something very similar to Daniel in The Karate Kid (at about 0:54). If we’re simply living life—dancing, singing, coding, negotiating, loving—this may be good advice as well. The way to do our best may not be to strain every sinew, but to relax and center. Or possibly both. I began to wonder some years back about the curious preference for monarchy in futuristic settings. In the world at large, monarchies have been retreating in favor of republics and democracies, at least in theory, since 1776. Why are SF writers so fond of equipping future societies with kings, emperors, and aristocracies? We can pass lightly over the old-time, pulp-type stories where royal rule is merely part of the local color: Burroughs’ A Princess of Mars (1912), Edmond Hamilton’s The Star Kings (1949), E.E. Smith’s The Skylark of Space (1928) with its Osnomian royal families. Here, like flashing swords and exotic costumes, monarchy is simply part of a deliberately anachronistic setting. Similarly in high fantasy, where aristocracy comes naturally in the typical pseudo-medieval milieu. But we see royal or aristocratic governments in more modern stories too. Asimov’s Foundation stories are centered around a Galactic Empire. (Since that series was based on Gibbons’ The History of the Decline and Fall of the Roman Empire, an Empire was inevitable.) Similarly in Star Wars, which draws heavily on Asimov. 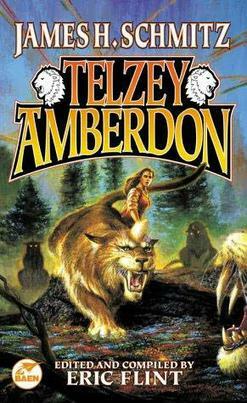 Jerry Pournelle’s CoDominium future history has a First and a Second “Empire of Man.” David Weber’s heroine Honor Harrington serves the “Star Kingdom of Manticore” (later “Star Empire”), modeled closely on England around 1810. Lois McMaster Bujold’s Vorkosigan Saga contains a number of polities with different forms of government, but many of the stories focus on Barrayar, which has an Emperor. Anne McCaffrey’s popular Pern series has no monarch, but has two parallel aristocracies (the feudal Holders and the meritocratic dragonriders). It got to the point where I began to feel a decided preference for avoiding monarchical or imperial governments in SF storytelling. There’s something that attracts us in royalty—or we wouldn’t see so much of it. I encountered this puzzlement directly. 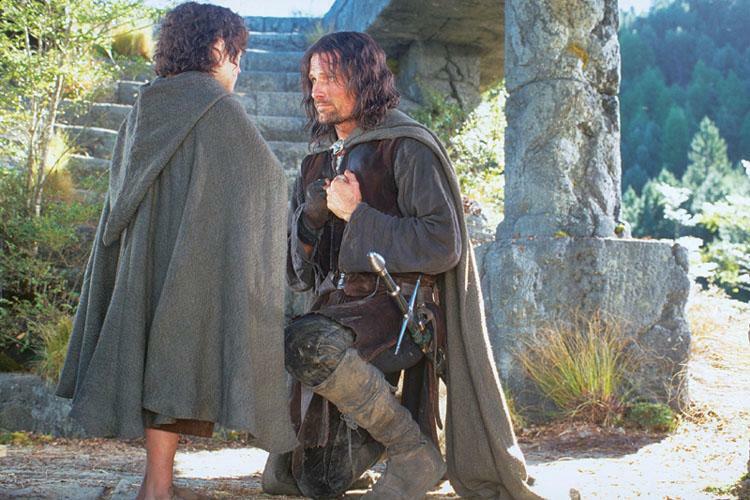 As a kid reading The Lord of the Rings, I was as moved as anyone by the return of the true King. I asked myself why. 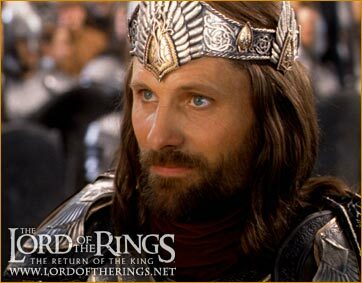 If I don’t even approve of kingship in theory, why am I cheering for Aragorn? The first point is obvious, but the others are worth examining. It’s been pointed out that even in a constitutional government, a monarch provides a symbolic continuity that may help to hold a nation together. British prime ministers may come and go, but Queen Elizabeth is always there. (Literally, at least within my lifetime.) This gives some plausibility to the idea of a future society’s returning to monarchy. Unfortunately, relying on the noblesse oblige of the aristocrats doesn’t always work out well. It depends on who they are. For every Imperial Britain, there’s a North Korea. When the hereditary succession breaks down, you get a War of the Roses or Game of Thrones. Too much depends on getting the right monarch. By the law of averages, it doesn’t take long before you get a bad ruler, whether by inheritance or by “right of conquest”—and you’re up the well-known creek. Personal loyalty appeals to us more strongly than loyalty to an institution. One can pledge allegiance to a state—but even the American Pledge of Allegiance starts with a symbol: the flag, and then “the Republic for which it stands.” Loyalty to an individual moves us more easily. This kind of loyalty doesn’t have to be to a monarch. Niven & Pournelle’s Oath of Fealty explores how loyalty among, and to, a trusted group of managers can form a stronger bond than the mere institutional connections of a typical modern bureaucracy. One can be faithful to family (the root of the hereditary element in kingship), to friends, or even an institution or a people. But it’s easiest with an individual. This loyalty is the basis for the stability factor above. In fact it’s always people who are acting. But it’s easier to visualize this when you have a single person to focus on. “When Grant advanced toward Richmond . . .” In the extreme case, we have the ruler who claims to embody the state in his own person: “L’état, c’est moi” (attributed to Louis XIV, the “Sun King” of France). In a fascinating 2008 essay, Jo Walton quotes Bujold on political themes in SF: “In fact, if romances are fantasies of love, and mysteries are fantasies of justice, I would now describe much SF as fantasies of political agency.” A science fiction character is frequently involved in effecting a revolution, facing down a potential dictator, or establishing a new order—exercising autonomous power. Walton links this notion of political agency to the fact that SF illustrates change: “SF is the literature of changing the world.” The world-changers can be outsiders, or they can be the rulers themselves—as in a number of the examples above. It’s not surprising that we’re attracted to characters who act outside the normal rules. We (especially Americans, perhaps) are fond of the idea that good people can act in ways that are untrammeled by the usual conventions. I’ve already mentioned Robin Hood. And the whole concept of the superhero—the uniquely powerful vigilante who can be relied on to act for the good—is powered by this attraction. But this idealization of individual initiative is also dangerous. Too much depends on getting the right hero—or the right monarch. It can only work if the independent agent is seriously and reliably good: virtuous, in the classical sense of virtue as a well-directed “habit” or fixed character trait. Even then, we may be reluctant to give any hero unlimited power. Too much is at stake if it goes wrong. No human being can be trusted with absolute authority. This is the kernel of truth in the aphorism that “power tends to corrupt and absolute power corrupts absolutely.” But we can’t get along without entrusting some power to someone. When we do, it had better be someone who’s as trustworthy as possible. What virtues do we look for in a good monarch—aside from the obvious ones of justice, wisdom, courage, self-control? If the ruler or rulers are going to be “servants of the laws,” they require humility. A king who serves the law can’t claim to be its master. Arrogance and hubris are fatal flaws in a ruler. For example, we should always beware of the leader who claims he can do everything himself and is unable to work with others. The good king is also selfless—seeking the common good of the people, not his own. Self-aggrandizement is another fatal flaw. In effect, what we’re looking for is a ruler who doesn’t want to rule: a king who believes in the sovereignty and the excellence of common people. We see the same essential humility and selflessness in other admirable leaders, kings or not: Taran in the Chronicles of Prydain, and the revolutionary princess in Lloyd Alexander’s Westmark trilogy; Niven & Pournelle’s Rod Blaine; Jack Ryan in Tom Clancy’s novels; “Dev” Logan, head of Omnitopia Inc. in Diane Duane’s Omnitopia Dawn—the unpretentious opposite of the “imperial CEO.” America was fortunate enough to have such an example in the pivotal position of first President, George Washington. At the other end of the spectrum, the most dangerous person to trust is an unprincipled and unscrupulous autocrat—someone convinced of his personal superiority and infallibility. Giving power to an individual who has no interest in serving the common good, but only in self-aggrandizement, puts a nation in subjection to a Putin, a Mussolini, a Kim Jong-un. The antithesis of the good king is the tyrant, who, however innocently he may start out, figures in our stories mainly as the oppressor to be overthrown. It’s much better, if possible, to intercept such a potentially ruinous ruler before the tyranny comes into effect: Senator Palpatine before he becomes Emperor, Nehemiah Scudder before he wins his first election. Allowing the tyrant to gain power may make for good stories, but it generates very bad politics. If we must have strong leaders, then in real life as well as in stories, character is key—and hubris is deadly.